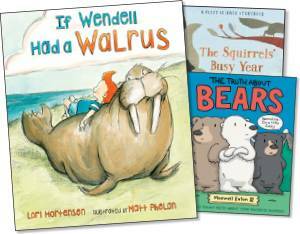 Bring the zoo to your classroom with this week’s prize pack of books, including If Wendell Had a Walrus (Henry Holt), The Squirrels’ Busy Year (Candlewick), and The Truth About Bears (Roaring Brook Press). To enter our random drawing, all you have to do is submit a comment telling us what your favorite animal is. Send it by September 27, 2018; one lucky teacher will win! Social-emotional learning is a hot topic; Magination Press has lots of books designed to help kids with life’s challenges. Hector’s Favorite Place features a hedgehog who struggles to break out of his comfort zone; Blossom Plays Possum centers on a shy possum who wants to have fun; and All My Stripes stars a zebra who fears others won’t understand his “autism stripe.” Check out these titles and more—and use the code LEARNING for 25% off at maginationpress.com. Click here now. 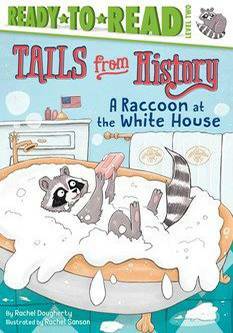 The new Tails from History series is just right for your beginning readers. These Ready-to-Read books have five different reading levels. And here’s something else fun: When you sign up for the Simon & Schuster email list, you’ll get to choose a free ebook. Click here to learn more. The Smithsonian Science Education Center has a whole pile of goodies for you. Choose your grade and topic and search digital resources, videos, games, and apps to find everything from a video about butterflies to an ebook about insects to activities about animal communication. And that’s just for starters! Explore it all at ssec.si.edu/explore-our-curriculum-resources. Meerkats, otters, elephants, penguins, it’s hard to choose a favorite! PS: Lots of little learners say their favorite friend is Peppa Pig. Enter Peppa Pig’s newest sweepstakes for a chance to win an Amazon gift card, Peppa Pig books, and more. Click here. My favorite animal is the giraffe. They always look so regal. Definitely giraffe. I think they are fascinating! My favorite animal is hedgehog. One of my favorite animals is the jaguar. My favorite animal is the koala, they look so cute and cuddly! Butterflies, so full of hope, yet so fragile. I like the lemur’s, just something about them! I like Hippos- they are so fun to watch in the water. My favorite animal is a bear–also a Baylor Bear Graduate!!! “Sic ’em Bears!!!! My favorite animal is the tiger. It knows how to stand out and how to blend in. My favorite animal is also the giraffe, but my kids love dogs as in Charlie the Ranch Dog who is the main character in Ree Drummond’s books. My favorite animal is the flamingo. They are bright, loud, loyal and feisty! My favorite animals are whales! I love them all! My favorite animal is the Gorilla ???? My favorite animal is a dolphin. ???? My favorite animal is a panther. I love all big cats but panthers are beautiful creatures. My favorite animal is the lynx. Love any baby animal, so adorable! My favorite animal is the giraffe. My favorite animal is the Koala!